Will intrepid Seattle detectives Sarah Linden and Stephen Holder finally nab Rosie Larsen’s killer in the 2-part finale of AMC’s THE KILLING? With just two more episodes to go (tonight, June 10, at 9/8c, and next Sunday, June 17, on AMC, check local listings), Season 2 of The Killing is just about to wrap and Rosie Larsen’s killer will be revealed. While I’m absolutely absorbed by this gripping crime series, the finale can’t come soon enough, apparently, for the naysayers who whipped up a storm of protest when Season 1’s finale failed to shut the door on the case. There were complaints about the rain, the pace, the red herrings, ad nauseam. This crankiness shocked me given the mindless, predictable stuff one typically finds on broadcast TV these days. Are attention spans getting so short (a plague of ADD or 140-character-itis?) that viewers can’t sit still long enough to appreciate the richness of a character-driven drama framed by outstanding direction, cinematography, editing and plot twists that actually twist, in this case, through the criminal underbelly of Seattle? There are no handsome or beautiful detectives here who flirt and banter with their partners and solve crimes in 60 minutes or less. 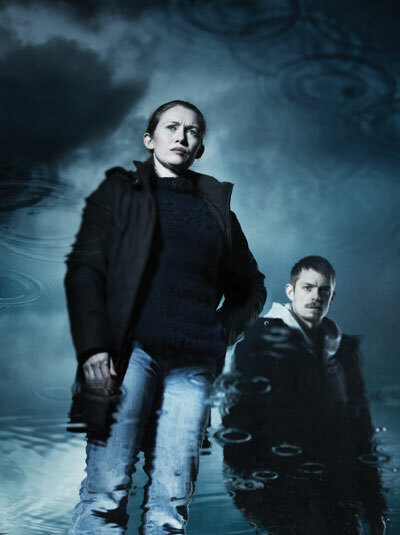 Detectives Sarah Linden (Mireille Enos) and Stephen Holder (Joel Kinnaman) are flawed, complicated and relentless. Both have dark pasts that haunt the present. Holder is an ex-addict and loose cannon and Linden is a vagabond single mom whose troubled childhood in foster care drives her obsession to right the wrongs of murdered children. Linden and Holder are mavericks and, as their prickly partnership settles into a comfort zone, their heads are prime targets for the corrupters within their precinct. And in TV land, they’re heads above the cookie cutter cops one finds on run of the mill cop shows. The casting is inspired and the scripts are superb. I find myself riveted every week as tightly-wound Linden and fire-cracker Holder maneuver through the corrupt landscape that surrounds the Rosie Larsen murder case. Recent episodes have smacked Linden and Holder into incredibly damning places and have actually given me chills they’re so brilliantly evoked. Aside from the dynamics of the Linden-Holden “partnership,” there are other fractured “families” to consider as well. There’s councilman and Mayoral candidate Darren Richmond (Billy Campbell) and his driven, potentially shady young advisors Gwen (Kristen Lehman) and Jamie (Eric Ladin). And there’s Rosie Larsen’s family: her ex-mobster dad Stan, vaguely detached mom Mitch (Michelle Forbes), Rosie’s bewildered younger brothers and their suspiciously evasive aunt Terry (Jamie Anne Allman). Lesser but no less important characters (and potential suspects) are also all sliding in and out of this scenario saddled with secrets galore. Stan’s vigilantism and parenting skills (brilliantly played by actor Brent Sexton) have been especially shocking and brutal. But, to the scripter and actor’s credit, I don’t think I’ve seen, in recent memory, a more moving portrayal of a grieving dad dealing with the conflicting emotions that come with the loss of a child. Stan’s clumsy attempts to make amends to his victims and to parent his young sons during a period of unimaginable grief are actually touching. I have less understanding of Rosie’s mom Mitch, who ditches her family to grieve on her own in seedy motels and bars. The Killing initially reminded me of Twin Peaks…same opening premise…a lovely teenage girl is found gruesomely murdered, floating in water, inciting a similar sense of ominous dread. A diehard Twin Peaks fan, I’ll never forget screening the opening two-hour episode prior to its premiere with a handful of fellow critics in a small screening room at ABC. We all sat silently mesmerized as we watched that groundbreaking David Lynch drama unfold. I stuck with the Twin Peaks series and never-ending Laura Palmer murder investigation, despite the fact that other directors and scripters steered its original promise into Crazy Town, USA. The Killing thankfully played out differently. At the end of Season 1, I was comfortable with its unsettling denouement and excited by the promise of more to come with the Rosie Larsen case. I wasn’t finished with it. Season 2 has travelled to dark places that no one could have predicted. Red herrings are the backbone of the very best murder mysteries, not their downfall, and those planted in Season 1 cleverly made sense. If I can guess a murderer or figure out a mystery in the first 10 minutes, I’ll be folding laundry or reading the newspaper while watching the rest of the show out of the corner of my eye. Not so with The Killing. Each episode has kept me glued to my seat and, frankly, goose bumps have been generated by the sheer mastery of the medium and genre. This entry was posted in Cable, TV and tagged AMC, Bereavement, Brent Sexton, Crime Drama, Family Relationships, Joel Kinnaman, Mireille Enos, Murder Mystery, Rosie Larsen, The Killing, Twin Peaks. Bookmark the permalink. I absolutely love The Killing too. I think it’s unlike anything else on TV at the moment: noir-ish but more gritty, less gauzy. The detached mother theme is very strong and disturbing. Between the mystery of Linden’s childhood traumas and its present effect on her son, and Mitch’s abandonment of her boys, I get very uncomfortable with the treatment of the child characters. But Sarah Linden is so fragile and sad; I can’t be mad at her. I find it interesting that the two very broken men, Stan and Holder, provide the only warmth in the show. All the other characters form a spectrum of sleaze. I’m addicted to this show too–it’s rich! Great points! It’s fascinating how, as you point out, two “broken men” provide the only warmth in the show. Terry does manage to parent Stan’s kids, put food on the table and provide a motherly influence; but although she appears to do all of the right things, her heart and soul seem to be elsewhere. She fits the “detached mother” theme as well, although she’s at the other end of the spectrum from Mitch and Linden. I continually root for Linden and am fascinated by her choices, but her inability to provide a stable home (at least, 4 consisten walls) for Jack is extremely unsettling. And Mitch came back last night to stir the pot once again. She aggravates me no end, so I was happy to see Terry and Stan set her straight. Gwen and Nicole are two creepy characters. At least we know where Nicole stands (it’s definitely gutsy to create a Native American villain today, especially one this evil); but with Gwen, the jury’s still out. Whatever her destiny, I hope, in the end, she doesn’t blame her actions on her love for Richmond. She hinted at that in last night’s episode (another red herring?). That would be so hackneyed.